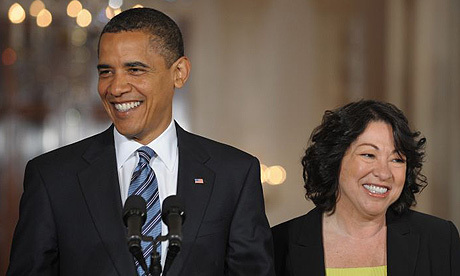 Sonia Sotomayor: A Hispanic Causing Panic with Conservatives. President Obama introduces Judge Sotomayor as his Supreme Court pick. Why is Sotomayor conservative enough for Bush Sr., but not Obama? Why is it rude to mention race unless you’re holding it against someone? Wouldn’t the GOP pat themselves on the back for being oh so inclusive if Obama had an R by his name? Why is bringing gender life experiences to the bench a con, unless they’re male? Why is bringing racial life experiences to the bench a con, unless they’re white? Why is bringing gender and racial life experiences to the bench a con, unless they’re male and black? How is a minority Supreme Court nominee an Affirmative Action nominee if all the finalists are minorities? The GOP doesn’t want to appear to rubber-stamp Obama’s choice especially since all he is doing is replacing a moderate-to-liberal judge with another moderate-to-liberal judge. The balance of power on the Court will remain as is. Were it a Scalia or Thomas or even Kennedy leaving instead of Souter, you would see the Republicans fiercely gear up to protect the conservative majority. With Judge Sotomayor they have to appear to put up a fight to satisfy their red-meat, right-wing Southern base of support but without ticking off women and Hispanics whose support they will need in the 2010 Congressional elections. It’s a tricky and delicate balancing act. But unless Judge Sotomayor flips the bird to Senator Sessions, the top Republican on the Judiciary Committee or there’s a dirty little secret in her past waiting to come out, she can start looking for an apartment in Washington. While we’re waiting for that other shoe to drop, let’s review Judge Sotomayor’s testimony to the Senate Judiciary Committee before her appointment to the U.S. Court of Appeals for the Second Circuit. But when I look at those cases, I have to say to myself, and I do say to myself, “You know, this could be your grandfather, this could be your grandmother. They were not citizens at one time, and they were people who came to this country.” … When I get a case about discrimination, I have to think about people in my own family who suffered discrimination because of their ethnic background or because of religion or because of gender. And I do take that into account. Oops! My bad. That wasn’t Sonia Sotomayor. That was some guy named Samuel Alito in his confirmation hearing for the Supreme Court. Wow. A White guy stating his “life experiences” shapes the way he might rule on a case. Looks like Judge Sotomayor will fit right in. ← New York on my mind. Thanks for writing, I truly enjoyed reading your most recent post. I think you should post more often, you obviously have talent for blogging!